Fort Caswell (1826-1865) (1894-1926) (1941-1946) - Originally built as a masonry Third System Fort on Oak Island, Brunswick County, North Carolina. Named for the first Governor of North Carolina, Richard Caswell. Used during the U.S. Civil War by the Confederates, outfitted with Endicott Period reinforced concrete batteries at the turn of the 19th century and used as a Navy Depot during World War II. Declared surplus in 1946. Part of the Harbor Defense of Cape Fear River. Fort Caswell was captured by Confederate forces 8 Jan 1861 just before the start of the U.S. Civil War. The fort was heavily fortified and remained in Confederate hands until abandoned and blown up by its own garrison on 17 Jan 1865 as Admiral David D. Porter's North Atlantic Squadron lay off the island. The Citadel and the barracks structures were burned out and heavy damage was done to the north and west walls by the magazine explosion set by the retreating Confederates. Admiral Porter documented the captured guns at Fort Caswell as follows: "ten 10-inch, two 9-inch, one Armstrong, four 32's, smooth, three 8-inch, one Parrot 20-pounder, three rifled field pieces, three guns buried - 29 guns". Union forces occupied the fort until sometime after the U.S. Civil War and in 1866 still had a garrison of 205 men at the post. but by 1872 it had only a caretaker presence. After the U.S. Civil War Fort Caswell was in caretaker status and remained that way until it was selected for reactivation as a part of the Endicott Board's recommendations for rebuilding coastal defenses. The consensus among the inspectors who visited the post in the 1870s and 1880s was that it had neither the armament or the quarters for a garrison. 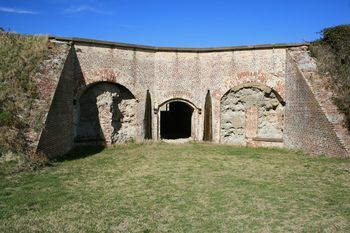 The Endicott Board recommended that Fort Caswell be armed with seven modern reinforced concrete coastal batteries. These batteries were built between 1895 and 1907. Two batteries (Battery Caswell and Battery Swift) were armed with a mix of large caliber and smaller caliber armament that apparently proved to be inadvisable and the small caliber, rapid-fire guns were removed and placed in new separate batteries (Battery Shipp and Battery Madison (2)). Battery Caswell was built into the structure of Old Fort Caswell and, as a result, much of what remained of the old fort was destroyed including the outer perimeter, the citadel shell, the moat and the river facing walls and casemates. The Endicott Period saw a somewhat orderly development of the post infrastructure that included permanent barracks for three companies, a substantial set of officer's quarters, senior NCO quarters, a hospital and many support structures. Many of these structures can be seen today, refurbished by the present owner and in use for their various activities. Like Fort Canby and Fort Worden, Fort Caswell is a great look at an Endicott Period Coastal Fort with well cared for, repurposed period structures. 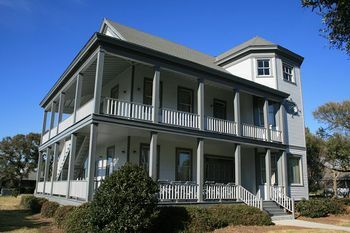 With the declaration of war in 1917, all six North Carolina National Guard companies that had trained at Fort Caswell were federalized and ordered to Fort Caswell. The activated troops were retrained at Fort Caswell and sent to the European front. Temporary barracks and tent complexes sprung up to house the federalized troops and the many new enlistees at Fort Caswell. Few of these temporary structures remain today. Three of the seven active coastal gun batteries ( Battery Swift, Battery Madison (2) and Battery Shipp) had their weapons dismounted for the war effort and shipped off to be modified for ground combat. None of the disarmed batteries was rearmed after the war even though all of the guns shipped to France were returned to the U.S. in 1919. 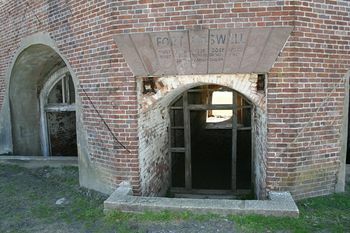 In 1924 Fort Caswell was placed in caretaker status and the final disarmament of the gun batteries began. By 1926 the remaining three batteries (Battery McDonough (2), Battery Caswell and Battery Bagley) were disarmed and the Fort was sold to private interests. 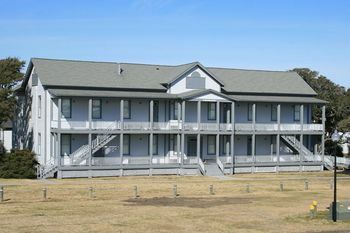 Fort Caswell was reacquired by the U.S. Government in 1941, at the beginning of World War II and became a U.S. Navy depot. At the end of the war, the Fort Was declared surplus and sold to the Baptist State Convention of North Carolina in 1949. Purchased by the Baptist State Convention in 1949 who then established the North Carolina Baptist Assembly on the property. No period guns or mounts in place. Location: Oak Island, Brunswick County, North Carolina.